Unofficial school referendum results from the April 4 election show voters approved 11 of 15 tax increase questions, 11 of 20 bond propositions, and two of eight county sales tax plans. The passage rate was 73 percent for district tax increases this time around, more than twice the historical average of 36 percent recorded since 1989. Local school districts were successful with four tax increase proposals for educational purposes. Tax hikes per se were approved in Deer Creek Mackinaw CUSD 701 (a 30 cent increase per $100 of equalized assessed valuation in their education fund); Edwardsville CUSD 7 (a 55 cent increase per $100 of equalized assessed valuation in their education fund); Pinckneyville CCSD 204 (a 25 cent increase per $100 of equalized assessed valuation in their education fund); and Princeton Elementary SD 115 (a 70 cent increase per $100 of equalized assessed valuation in their education fund). Seven tax increases were also approved through Property Tax Extension Limitation Law (PTELL) ceiling increases. Voters apparently failed to pass tax referenda in Aviston Elementary SD 21, a proposal that fell two votes short on election day, although it could still be adopted if pending absentee vote counts favor it; and another tax hike failed by just 49 votes Metamora CCSD 1. PTELL tax hike proposals were defeated in just two districts: Norridge SD 80; and Sandwich CUSD 430. Although tax increases fared the best by far, the 55 percent passage rate for building bond issues this time around was just above the mean average approval rate seen for bond issues in April elections in odd-numbered years since November 1989, which stood at 50 percent. But the 55 percent rate this time was slightly below the 58 percent approval rate seen for all building bond elections overall. 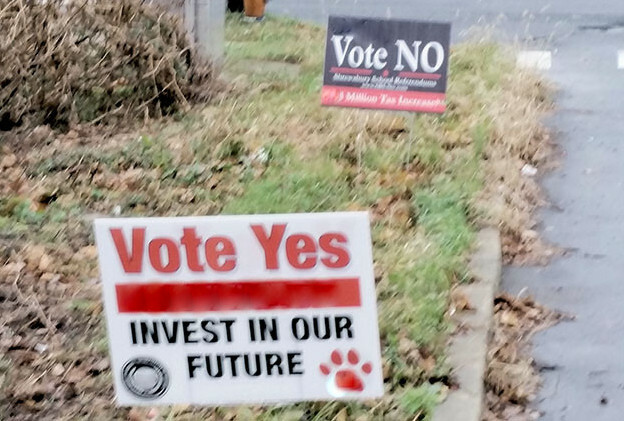 Of eight countywide sales tax increase proposals earmarked for school facility purposes, voters approved just two, in Cumberland, and Montgomery Counties. Some of those proposals were decided by relatively narrow margins, with a 259-vote defeat (21,846-22,105) in Madison County and a 193-vote victory margin (1,924-1,804) in Montgomery County. To date 49 counties have adopted a sales tax to benefit school facilities, or nearly half of the state’s 102 counties. In other voting, a proposed school consolidation failed to combine Alwood CUSD 225 and Cambridge CUSD 227. But another kind of school district reorganization passed in Bismarck-Henning CUSD 1, where the board was seeking voter authorization to enter into an agreement to jointly operate a cooperative high school with Rossville-Alvin CUSD 7. Meanwhile, voters approved at least two of five propositions to require at-large election of school board members. Such proposals were adopted in Community High School District 117 (Lake Villa), and Northwestern CUSD 2 (Palmyra).